SUSHI KING BLOG: What is WASABI & how to make it. Wasabi, also known as "Japanese horseradish", is a hot Japanese spice root and an important member on any sushi table. Some like to mix it with soy sauce bowl for future dipping, and some rather place it directly on the sushi just before they eat. For more information about the origin of wasabi check out wikipedia on wasabi. 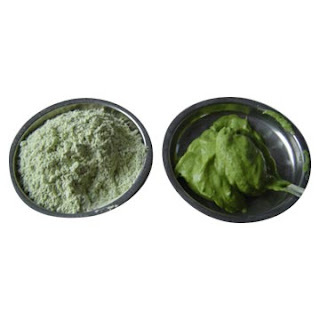 Wasabi products for sushi can be obtained in Asian food stores in the form of dried powder or ready to use paste, and used in very small doses (pea size or less). 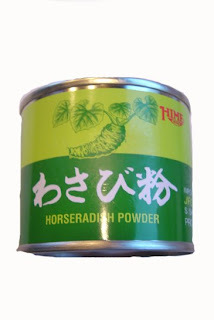 In order to fully enjoy your Wasabi - you should use the dried wasabi powder to produce your own fresh wasabi paste - the following guide will walk you through this simple process. step 1 - Since the wasabi powder needs to stay dry when kept in order to stay fresh - try carefully not to dent the can top when opening so, this way your wasabi can last for a long sushi making period. Use a dry tea spon (or pour gently right from the can as shown in the animation). 3-4 tea spoons should be enough for a sushi session depending on your personal wasabi consuming habits. step 2 - Add a small amount of cold water, about 1:1 ratio with the amount of wasabi powder you used and stir until a solid mixture is obtained. Now you need to gently balance the mixture with a bit more powder if you like your wasbi thick, or water if you want it to be thinner. step 3 -Now that the wasabi paste is ready - you can form it into shapes - try to be original and surprise your sushi guests! Yey, Shushi King have a blog now. Do update your customer more about ur menu (still not try the curry yet) and info about Japanese food and lifestyle! Hi guys. I'm actually going to start making some sushis sometime this week and I was wondering can I use wasabi for making spicy sushi? or is it that spicy? How to make a simple Sushi Roll.